There is something very special about flowers. It was Ethan’s first word, although he pronounced it ‘wowers’. And ‘Fleur’ is also my middle name. So it seems apt that we love having beautiful flowers in our home. While a single bouquet of flowers is probably one of the most popular gifts of all time, have you considered buying someone a flower gift subscription this Christmas? We received some beautiful flowers from Appleyard, a boutique London florist, who offers a monthly gift subscription. You can choose the length of subscription, and the first bouquet, and they will do the rest. The lucky recipient will receive a beautiful, fresh, seasonal bouquet every month. The longer you subscribe for, the more money you save on each bouquet. Flowers are sourced from British growers where possible, and Appleyard has designed the packaging to produce as little waste as possible, which is fantastic. There are so many reasons why flowers make the perfect gift. Here are just a few. Flowers have this kind of magical quality that can cheer you up and make you feel happier. If you’re feeling in a bit of a slump, flowers can often give you a much-needed pick-me-up. There have even been studies which have shown that having flowers nearby can help you feel less anxious and less stressed. I know that having a beautiful bouquet in our home can really improve my mood. Just looking at the gorgeous, colourful blooms makes me feel instantly happier and calmer. Colour is a big thing too. While I don’t know much about colour therapy, I do know that there are certain colours that can elicit different moods. We all know red signifies love, but did you know that blue is calming, orange promotes happiness and joy, and green represents harmony, good fortune and security? Personally, I think there’s nothing lovelier than stepping into a room and smelling gorgeous flowers. A beautiful bouquet can instantly transform your home – both how it looks and how it feels. Now that we’re heading into winter which, let’s face it, can feel a bit dreary and drab at times, colourful blooms could really help to brighten up a room and make it feel much cheerier. Flowers can really make a statement, even in a small home. Unless you’re one of the Kardashians, where their homes are filled with a million beautiful blooms every single day, flowers are generally a special treat. So a monthly delivery of beautiful, fresh cut flowers will really make the recipient feel like they’re being treated every single month. And that’s a lovely feeling. Appleyard were kind enough to send me their Christmas Chutney bouquet for this review. My flowers were delivered by DPD and arrived in a beautiful box. I have to say, the bouquet is absolutely gorgeous with roses, lilies, berries, and even gold foliage which is a lovely festive touch. The colours are stunning too. 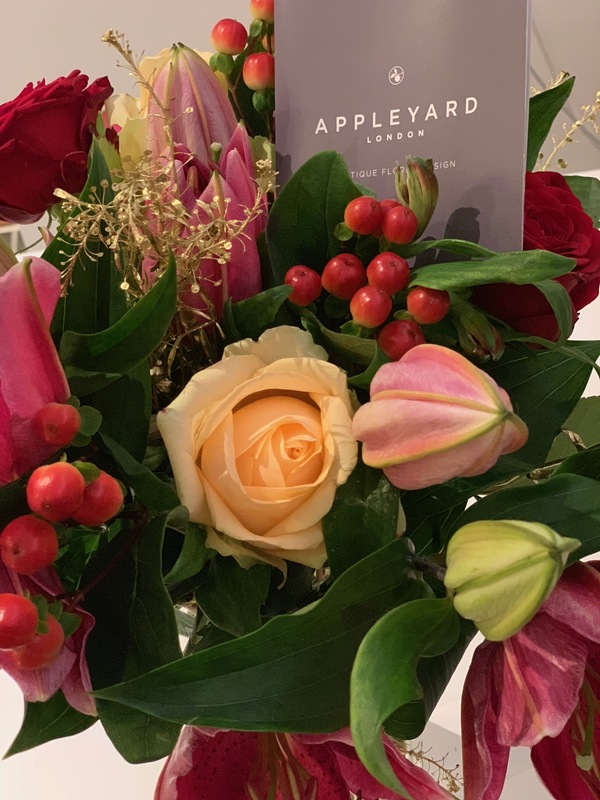 If you buy Appleyard’s monthly lux subscription for a Christmas gift (from £26 per month), this is the first bouquet the recipient will receive. There is also a classic subscription which costs from £22 per month. The bouquet came with care instructions which I followed carefully. I trimmed the stems, I removed leaves below the water line, as well as guard leaves from the flowers, and I added feed to their water. They lasted for a week, which I think is about right for cut flowers. A flower subscription is a such a lovely idea for a Christmas present, and not a gift I’d considered before. You can brighten someone’s mood, and their home, each month. You could also gift them to yourself! As we know, self-care is very important so why not treat yourself every month? I’m pretty sure you deserve it. For more information on Appleyard’s flower subscription, visit the Appleyard website. Disclaimer: Mums Off Duty was gifted Appleyard’s Christmas Chutney bouquet for the purposes of review. My reviews are always completely honest.